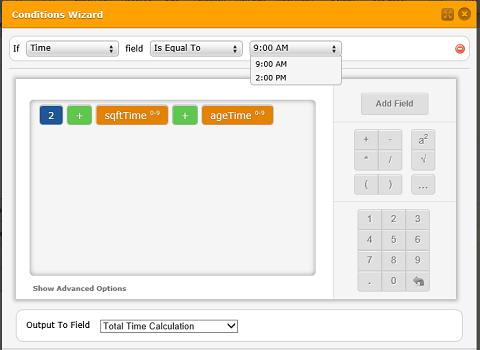 The Wizard will not allow me to input 2:00 PM on the first condition, which is 9:00 AM. This was the same problem above. Some times it works, sometime it doesn't. No sure how to fix it or what causes it. It appears after your company opens it, it clears up. Based on everything that you have described I would have said that it is a problem with your browser cache since you said that once you cleared it out it worked for you, but seeing how you also mentioned that it is happening on different browsers, it is less likely to be that. I also cleared out your Form Cache which should not be causing this, but this would allow us to have a clean start. Now what I would like to ask you is to open either FireFox or Chrome and try editing your form in either of the two browsers. I suppose that you will no longer have any issues, but would like to confirm the same. Also, can you please tell us if the two browsers you had experienced this issue were Internet Explorer and the newer version of the same browser - Edge? Same thing is happening again. I really can't be the only one getting this problem (maybe). I did figure out that its alpha numeric related. 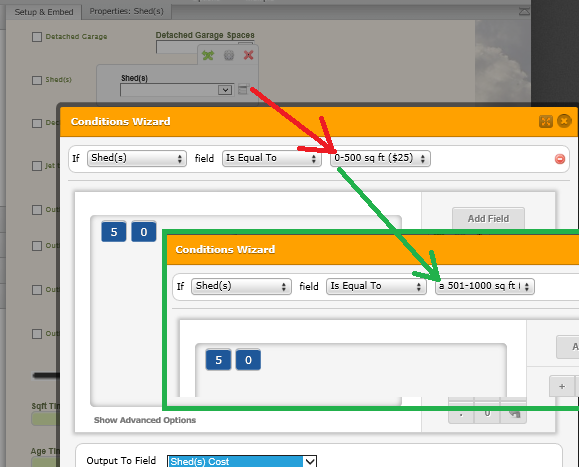 Looking at the screen shot, the first time (red arrow) I try to select "If Shed(s) Is Equal To 501-1000 sq ft" it will not allow me to do so, only the first selection shows up, which is ""If Shed(s) Is Equal To 0-500 sq ft ($25). Adding the letter "a" (green arrow) in front of the second selection allows me to enter that into the calculation. If I take the "a" back out, it doesn't allow that selection. Thank you very much for providing the details on how to reproduce the issue. After fairly extensive testing, I could reproduce the issue in Internet Explorer 10 or 11 - it works just fine in Firefox and Chrome. Thank you very much for providing the form, screenshot, and steps for how to reproduce this issue. It has now been raised to our developers as a bug, and we will update you through this thread when our developers manage to fix it. Until the issue is resolved, I would kindly recommend using either Firefox or Chrome as your browser while editing your forms in our Form Builder.